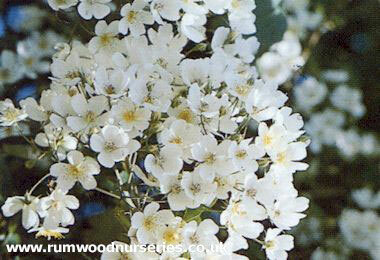 Rumwood Nurseries specialises in the growing of roses, shrubs and trees. Established in 1965, Rumwood Nurseries has now been providing the trade and public with top quality nursery stock for over 50 years. Our experienced workforce comprises some of the most skilled labour in horticulture. We offer a friendly and reliable service supplying both trade and retail across the British Isles and into mainland Europe. When dealing with Rumwood Nurseries, either through this website or by visiting us, you are guaranteed that you will get the personal attention and service that you really want. Here at British Roses we are passionate about providing you with the best plants and have been doing so for over 50 years with our roses. We now have a grand selection of Potted Peony Plants. These are the perfect partner to plant with our roses in a mixed border or making a huge statement on their own. Our peonies are supplied potted throughout the year. The peonies are a 3-5 eye root which will give you a good size plant in the first year. View our stunning collection of potted peony plants, including popular varieties such as Raspberry Sundae , Big Ben , Armani , Bowl of Beauty , Coral Charm and Many Happy Returns . We specialise in mail order deliveries of Roses - a service we have been operating for over 50 years. Mail order deliveries of Potted Roses are made throughout the year. Bare root rose plants are delivered from November through to March, subject to weather conditions, although can be ordered at any time. Ordering is simple - call us on 01622 861477 or use the WorldPay Secure Payments Service on this website. New from British Roses - our Special Occasion Gift Sets are potted, presented in a ribbon-tied hessian bag and safely packed in a strong cardboard container to ensure that they arrive in pristine condition. Included in the price is a greetings card with your personal message. 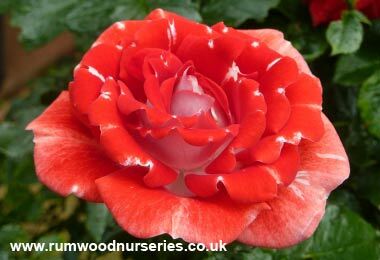 Also, each rose, which is in a 4 litre pot, is supplied with an attractive coloured label with a picture and description of the rose. Let someone celebrate that special day with a beautiful rose gift that gives lasting pleasure and enjoyment whether it be for a birthday, anniversary, wedding, retirement, house warming, Mother's Day, Father's Day, or just to say thank you. A bouquet of roses can be quite expensive considering they will only last a week or so. 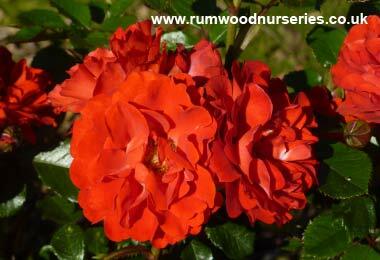 A living rose bush will last for many years and give far more enjoyment. Ruby, Pearl, Golden or Silver Wedding Anniversary? Someone's Birthday, Wedding or Engagement? Congratulating someone? A Rose to remember a special person by? Why not buy a rose for that important occasion from our collection of Special Roses? 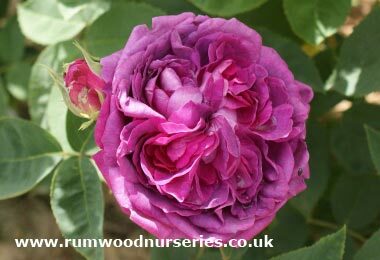 See our new section on roses that are suitable for growing in difficult areas. 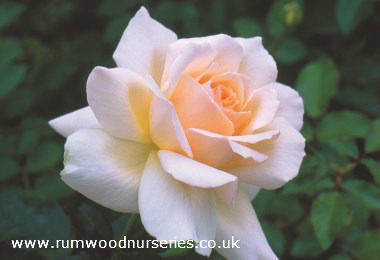 Whether you have a North facing wall or shady spot in your garden, we have a rose for you. We also have roses that can be grown as hedging and dense thorny barriers, which form an attractive yet effective boundary to protect your property. Shown here is Mme Gregoire Staechelin growing in the fine Culpeper Garden at Leeds Castle in Kent, which is just minutes away from where we grow our roses at Rumwood Nurseries & Garden Centre . 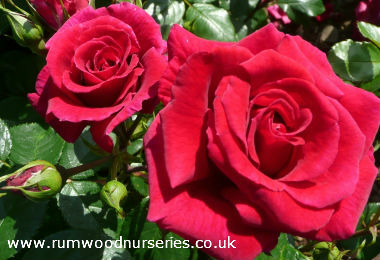 Vigorous climbing roses, diverse in growth and colour, some flowering in summer only, others flowering more than once in the same season, flowering in summer - autumn. 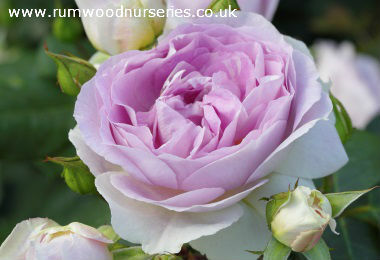 Climbing Patio roses are ideal for use when one requires a climbing rose minus some of the associated vigour. 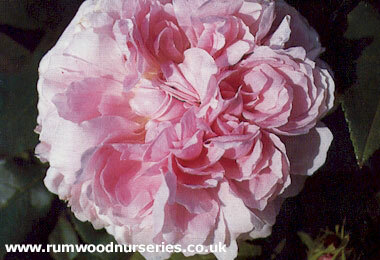 The more compact growth gives a denser mass of floribunda type blooms. 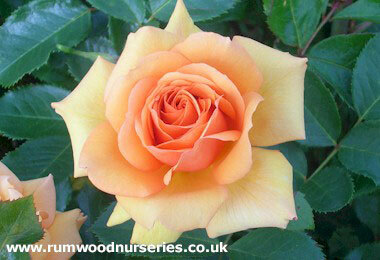 Floribunda roses take the form of a cluster-flowered bush. Shrubs that usually bloom more than once in the same season - usually large sprays of flowers in summer - autumn. Unrivalled for providing a long-lasting bedding display. 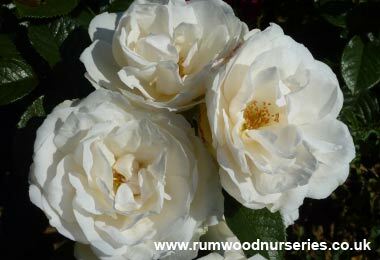 Ground Cover roses are ideal for difficult areas, banks, places that are difficult to mow, etc. These plants form a colourful ground cover 'mat' between 30cm and 60cm in height with slight scent. The ever popular Hybrid Tea grows as a large-flowered bush. Differs from the floribunda group in that its blooms are larger and less in number. The striking blooms tend to be a classic rose shape. They usually bloom more than once in the same season with large flowers borne in summer - autumn. Patio & Miniature roses have limited growth and so can be successfully grown in restricted situations, for example, in pots indoors, rockeries, troughs, flower beds close to the house. All strong growing with Floribunda type blooms. Ramblers are more rampant and pliable in growth than climbing roses. 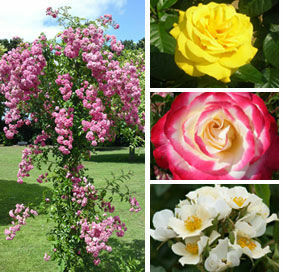 Shrub Roses are a diverse group of roses. Most bloom more than once in the same season and are larger than bush roses, with flowers borne singly or in sprays in summer and/or autumn. Standards give that extra depth and third dimension to flower beds and borders. They also look great in pots. Stems are approximately 1m tall. Half Standards are just slightly lower than the full Standard. Stems are approximately 0.75m tall. Quarter Standards look great near the patio or in a pot. Stems are approximately 0.5m tall. Mini Standards are great in pots for standing on a patio. The stems are approximately 0.3m tall. Weeping standards have a stem that is approximately 1.25m tall. We are members of The Rose Growers Association, The Horticultural Trades Association and are a Registered Grower of the British Association of Rose Breeders.